Burnley's run of 67 league games without a penalty came to an end as Ashley Barnes earned a point for the Clarets against Southampton in a dramatic finale. The striker, who netted the Clarets' last penalty in the league at Turf Moor in a 4-1 win over Sunderland in the final game of 2016, punished a Jack Stephens error, with the Saints defender handling Ashley Westwood's cross deep in to stoppage time. Justice was served after referee Anthony Taylor remedied his first half mistake when goalkeeper Alex McCarthy escaped any punishment for a blatant foul on Barnes inside the box. On that occasion it was Burnley's all-time leading scorer in the Premier League that was penalised, much to boss Sean Dyche's frustration on the sidelines. Burnley were the better side for much of the opening half, though it took a close shave with returning forward Danny Ings to get them going. The 26-year-old, who left for Liverpool in 2015, only had Tom Heaton to beat when racing beyond Ben Mee to collect Matt Targett's ball. But the Clarets captain made himself big to block the attempt. Barnes and Jack Cork both had close range efforts blocked when Mee helped Dwight McNeil's corner back in to the six-yard box before Chris Wood blazed over the top right-footed having cut past Jack Stephens inside the penalty area. It was at this point the drama unfolded. Match official Taylor stalled when Barnes had his legs taken from under him. However, his eventual conclusion was completely unexpected. The striker anticipated the contact from the England international, drawing the foul after bringing Phil Bardsley's pass down inside the box, and contact was clearly made. However, after a brief discussion with his assistant, the match official inexplicably booked Barnes for diving. 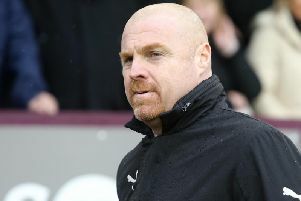 It's becoming a sour topic for Dyche, who hadn't seen a referee point to the spot in his favour in more than 6,000 minutes of football at that point. Just to put that in to context, Luka Milivojevic scored his 14th penalty for Crystal Palace, in the victory over Fulham at Selhurst Park, during that timescale. It was a hard pill to swallow, particularly given the manner in which Manchester United were afforded a way back in to the game at Old Trafford midweek. The hosts had to accept the decision but salt was rubbed in to those gaping wounds 10 minutes in to the second half when Nathan Redmond put the Saints ahead. The winger, operating in a more advanced role, collected the ball 35 yards from goal and was allowed to travel with it before firing the ball in to the bottom corner. The home side battled back, introducing Johann Berg Gudmundsson and Robbie Brady over the course of the second half, while deadline day capture Peter Crouch was introduced for his debut. Barnes squandered a golden chance to level when the ball ricocheted fortuitously in to his path but the forward failed to find a way past McCarthy. The former Brighton man then thumped the crossbar with a volley, watching Gudmundsson's header over his right shoulder after Taylor had supplied the cross. But they had their reward with just seconds remaining. In a desperate final bid, with men committed forward, Ashley Westwood launched the ball in to the box and Crouch helped the ball on to Stephens's raised arm. Barnes stepped up and drilled the ball low past McCarthy to extend his side's unbeaten run to six games unbeaten in the top flight.